What Does the Big Mac Index Have to Do with Forex Trading? As a franchise, Discovery Map has never been more excited about its position in the world of local advertising. The free, artistically styled, engaging, user-friendly maps that are now found throughout the country and internationally have been the pillar of the company’s and franchisees’ success. We recently spoke with Discovery Map CEO Peter Hans about the future of the franchise, what he looks for in potential franchisees and what a typical day in the life of a franchisee looks like. Discovery Map is a multimedia advertising opportunity. Being home-based, allowing a flexible schedule and having ties to the travel industry, it truly allows franchisees to build their business around their lifestyle. What is the idea behind the Discovery Map franchise? People who visit a new area or revisit a place with which they are familiar need a means to orient themselves quickly and easily. Our printed maps, the backbone of our program and in continuous publication since 1973, offer just that. They give travelers information on where to go and what to do just as they are making purchase decisions. How does Discovery Map compare to its competition? You have heard the phrase “often imitated, never equaled?” Well, that’s us. There are local competitors around the country that use a layout similar to ours. The trouble is, a similar layout does not equal a quality hand-drawn map. It is not easy to replicate what we do but with our system, established, tested and tweaked over the years, we can produce these hand-drawn maps at a higher quality, in less time and at a lower cost that anyone we know of. Also, with over 100 franchises in the system, we have resources that small operators do not. This has allowed us to build a web and in-room presence that smaller businesses simply cannot. First of all, we want folks to be successful so we look for people who are comfortable engaging others and establishing new relationships. People often ask us if sales experience is necessary. Our answer is: it can be helpful but is not necessary. If you like to meet new people and are happy to share an exciting new opportunity, you should be fine selling advertising. Where do you see Discovery Map in five years? I hope that in five years Discovery Map International has over 200 franchises and is even better known than today as the go-to source for information on great destinations in the U.S., Canada and Europe. Can you describe a typical day in the life of a Discovery Map franchisee? Well, a franchisee who owns a single map has three principle phases to their annual business activity: sales, production and distribution. Sales is the most important element of the overall activity and is most directly related to generating revenue so let’s focus on that. During an average day of sales, a franchisee will spend most of their day calling on prospects or (after the franchise is established) existing customers. These are generally face-to-face visits and can vary in time from about 15 minutes to 30 minutes. So, this looks like driving or walking around town, seeking out business decision makers and presenting the Discovery Map advertising package to them. I grew up in the Northeast and after completing an MBA I lived in Europe for 12 years and worked there as an investment banker. In that role I got to travel a great deal and do deals and work with lots of interesting people with diverse backgrounds. I now live in Vermont with my wife and two daughters. We love the outdoors and I still get to travel to help set up new franchises. When I became involved with Discovery Map nearly 10 years ago, it was purely a print-based business. The world has changed a lot since then and all publishers are working hard to keep pace with the development of digital media. As our print publication is free, we have a leg up on many other publishers but we are not resting on our laurels. We have developed a compelling web presence that includes a mobile optimized site that acts as a hand-held guide once folks arrive at their destination. We have also recently begun to roll out a new program that presents our maps and certain other advertiser information on hotel Wi-Fi login pages. This challenge of moving a successful publishing business from print-only to print and digital keeps things interesting and keeps me motivated as we grow and diversify our company. This may sound trite but I feel like I have been blessed in both my life and my career. I have not always traveled directly from A to B but I have always gotten to the right place in the end and I am having a great time along the way! During the course of my career, I have found that drawing lines in the sand and giving ultimatums usually backfires. I believe that by listening carefully and trying to understand one’s business counterparties’ real needs and desires, one can get far more accomplished. While working my way through college, I did a stint washing dishes at a local restaurant. My boss was particularly unfriendly and seemed to relish in criticizing my end-of-shift clean up efforts. Two key takeaways: study hard to broaden my opportunities and being your own boss while bringing risks can also yield great rewards. I enjoy building a business. I suppose that I am atypical in that I don’t shut off at 5 PM. I continue to think about improvements and how we can create value. I do this not because I feel that I should but because it is what I really love doing. We spend about one-third of our adult lives working. We cannot really excel at something unless we are passionate about it. By finding what you really care about and applying yourself fully you can make good use of the time you spend working and have a great time doing it. 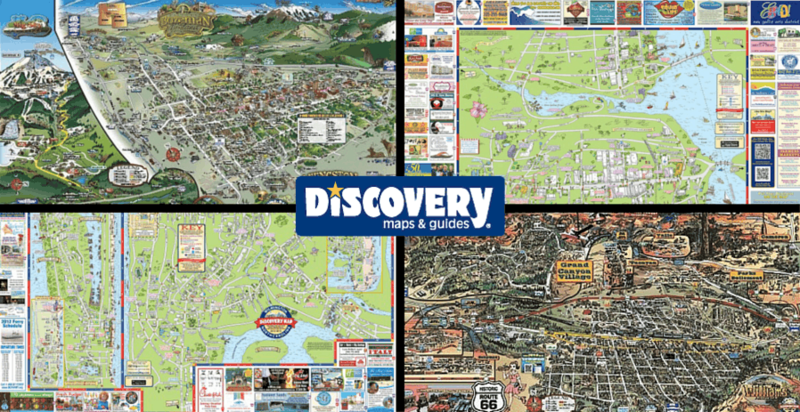 Where can people get more information on Discovery Map franchise opportunities? Where can people find Discovery Map on social media?